If you're looking for a holiday cottage to share with friends and family; and you're looking to take that holiday in south Wales, the cottage we feature here may well be the one for you. The cottage in question is "Little Newton Farm" in Kilgetty, Pembrokeshire. 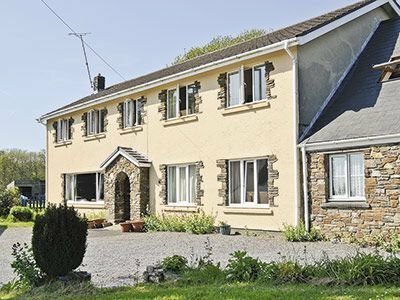 Little Newton Farm sleeps 12 people in 6 bedrooms, so is perfect for sharing a holiday with friends and family. Set in a rural location, Little Newton Farm has some great views out across the landscape, and makes a good place to enjoy a quiet holiday. The 6 bedrooms are made up of 3 double bedrooms and 3 twin bedrooms; and all modern conveniences are included in the cottage: gas central heating, TV and DVD, bed linen and towels are included. Little Newton Farm has a lovely large garden to enjoy the summer sun too. You can enjoy those views from the garden (the photo on the left shows you the views to expect when having a cup of tea in the garden); or you can get out and see what's happening in the area. The seaside town of Tenby is a couple of miles down the road. Tenby has some good beaches, and is a nice place to enjoy the sun. Or, when the weather isn't quite so nice, you could visit the Blue Lagoon pool in Narberth. The Blue Lagoon is very close to Little Newton Farm - probably about 2 miles away - and is a haven for those with children in tow; there's a few water chutes, a wave machine and a lazy river. We took our children to The Blue Lagoon, and we all had a fantastic time. The Pembrokeshire Coast National Park is a little further away, but still an easy drive, and has stunning scenery and rugged coastline. Meanwhile, back at the cottage, you'll find the nearest shop and restaurant to Little Newton Farm is 300 yards, and the pub is 100 yards from Little Newton Farm.